CHECK TIMING CHAIN WEAR BEFORE IT DAMAGES AN ENGINE. As a farmer, you wear many hats, but none of those hats contain X-ray vision, so you need to employ other tactics. When it comes to crops, you may dig a root pit, perform soil analysis, or pull tissue samples. These procedures allow you to see what’s going on above and below the ground. When it comes to the timing chain in an engine, there is an accurate method for determining its wear without taking the engine apart. Once you see how simple it is, there will no longer be any question about the chain’s condition. Since the camshaft and, thus, the timing of the valve events are controlled by the rotation of the crankshaft and often linked by a chain, any wear of the chain will affect not only the valve action but also the timing of the ignition through the distributor. The stackup created by stretch in the timing chain can present itself in many different ways. The first sign is a decrease in engine performance. As the chain grows longer, there is a possibility of it actually wearing through the timing cover. If the chain tension skews enough, it can jump a few teeth on the timing gear and, at best, the engine will stall. At worst, a piston collides with a valve and potentially ruins the block and cylinder head. 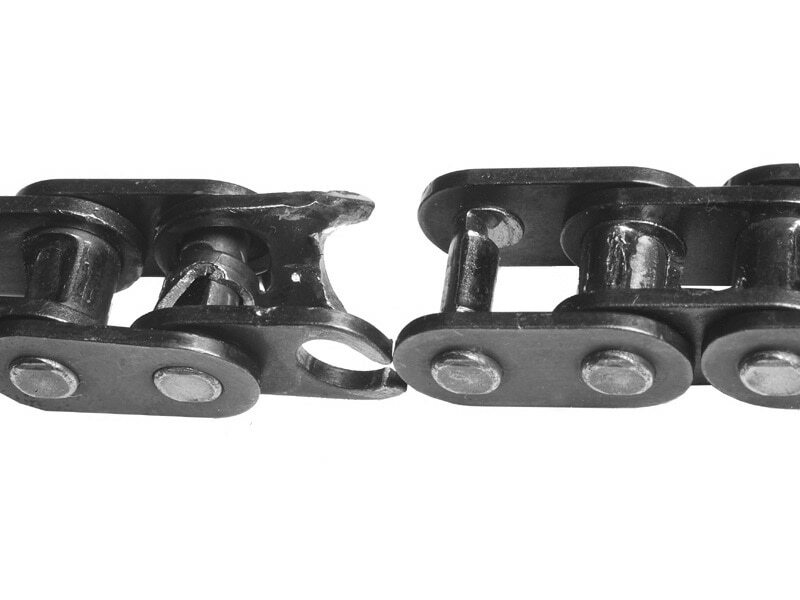 In some cases, the chain will make a knocking noise if it is extremely stretched. Just don’t count on that warning before a stretched chain does serious damage. As the timing chain wears, the position of the camshaft in relation to the centerline of the intake lobe retards. As the distributor is run via the gear on the camshaft, so the position of the distributor shaft and primary trigger (breaker points or reluctor with electronic ignition) will change and retard the ignition timing, too. A first sign of a timing chain with excessive slack is a change in ignition timing with no change in the position of the distributor housing. For example, let’s say you set the timing at 10° BTDC (before top dead center) and the distributor hold-down is tight. If over a period of time the timing is now at 6° BTDC, the most likely cause is slack in the timing chain. You can then just reset the ignition timing to the proper specification, but you do need to keep in mind that there is wear in the chain. Over the years, I have seen many engines that were junked due to a worn timing chain. Some had a rhythmic knocking sound that was misdiagnosed as a rod bearing or a lack of power interpreted as the engine being very tired. For this reason, you should never jump to conclusions when diagnosing an engine. What appears to be a major problem is often a minor one. To accurately identify the amount of wear in a timing chain, you begin by removing all of the spark plugs and the distributor cap. With a wrench on the harmonic balancer bolt, turn the crankshaft at least two complete revolutions backward of rotation to remove any slack from the timing chain. While you are still turning the crankshaft opposite to its running rotation, bring the timing mark on the harmonic balancer to TDC (top dead center) on the timing tab or pointer. With a helper watching the distributor rotor, gently turn the crankshaft in the proper direction of rotation. As soon as the rotor tip starts to move, STOP! Read the amount of stretch on the timing tab. For example, if the rotor tip began to move at 10° ATDC (ahead of top dead center) as measured at the timing mark, the chain has experienced 10° of stretch. Any reading more than 4° to 5° is considered excessive, and you need to schedule time to install a new timing chain and gear set. As an aside to this, many early GM light-duty diesel engines used in pickups foolishly employed a timing chain instead of a gear train to run the camshaft and the injection pump, since the engines were based on the gasoline versions. Due to the rotational load on the chain, it was common for excessive stretch to occur over time. A diesel injection pump timing is not as forgiving as the distributor on a gas engine. The result with using the timing chain in the GM diesel was a poor running engine, but few mechanics knew it was caused by a worn timing chain.